Welcome to the continent of Tamarra, home to the world of Beyonder! Follow the Setting link to discover Tamarra’s abundant geography of plains, mountains, seas, and more; discover the underlying Six Energies and the guilds that channel them; and immerse yourself in its history. Meet the Ten Races. When you create a new character to play Beyonder, you can be any one of these sentient beings. 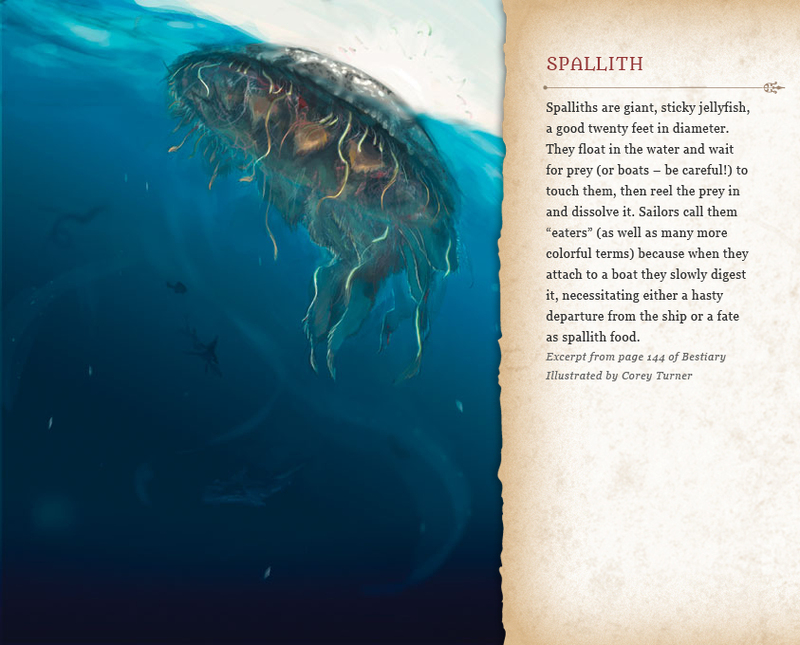 View our Gallery to see some of the many Creatures you may encounter in your adventures. Check out our Map to locate where it all takes place -- and plan the route of your next adventure. From here, you can explore the setting of Beyonder. The Continent of Tamarra spans several thousand miles of thick forests, grassy plains, huge deserts, mountain ranges, rivers, and lakes, and is bordered by the Kellith Sea on the east and the Lossolla Sea on the west. The world is permeated by The Six Energies, forces of nature that shape the world and all who live there. The Guilds work to develop The Six Energies as a science. Members are trained to channel the Energies, creating effects of great power. Tamarra’s history tells a story of many ages; great vision and overthrown emperors, invasions and dark rumors, and more recently, governments and services, cities and trade. 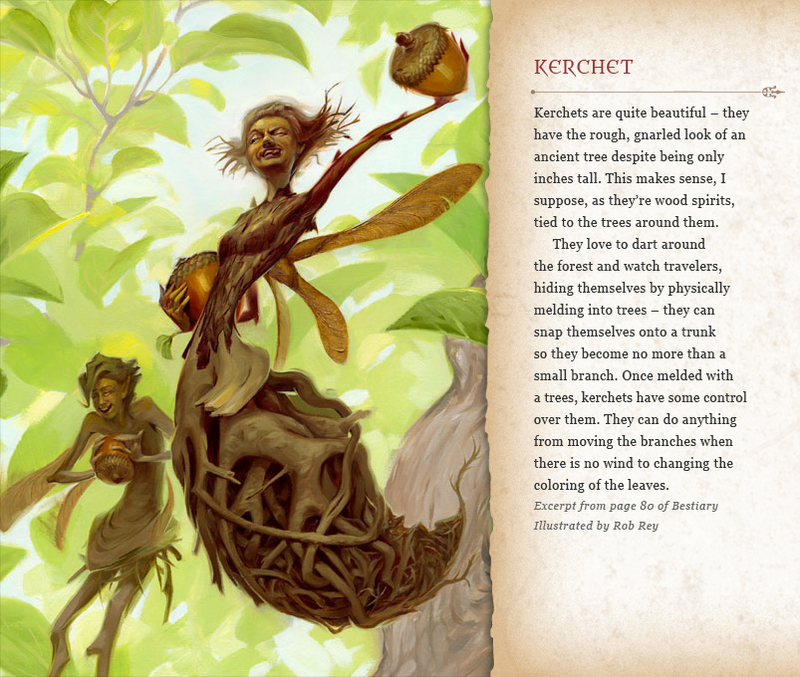 The world of Ethem is vast and varied. There are many other continents across the seas, but those seas have been unsafe for a very long time; none but the Zweyjen have dared to cross them. For all other races and creatures, the Tamarran Continent is the known world. Tamarra is very large, several thousand miles from the Icy Wastes in the north to the Maharrin Subcontinent in the south. 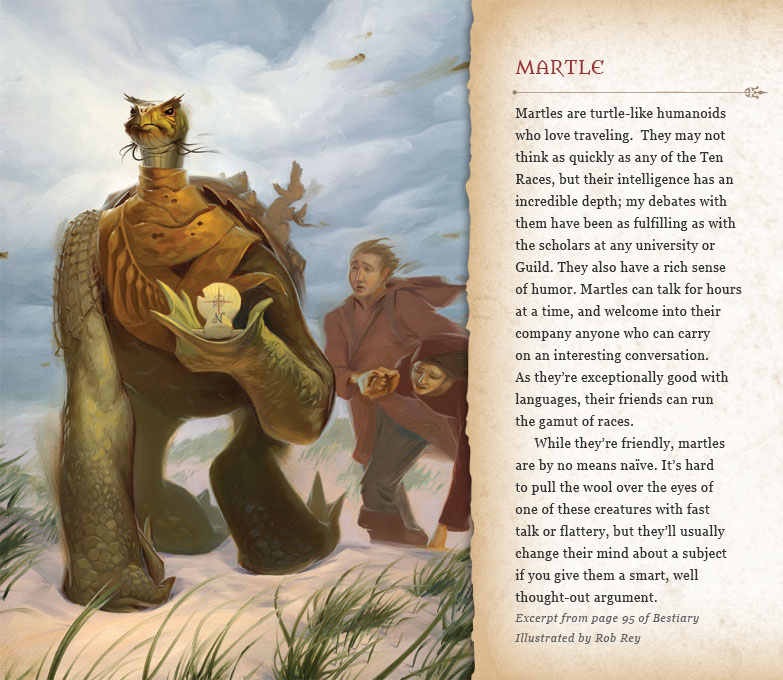 It is many hundreds of miles across, and covered with a wide variety of creatures, kingdoms and geographies. 'Civilization' is concentrated in the northern and southern areas of the continent. In the north is the Kingdom of the Szaskar Crawn (one of the crawn empires of Tamarra) and the city of Tarnath, once the seat of great King Samron who nearly ruled all of Tamarra. To their west is Naldrin City, home to the Council of Drawnwyn, and the seat of much power across the continent. This great city, carved out of the mountain by Dwarves and Ishiri, is now home to every one of the Ten Races of the Tamarran Continent. In the center of the continent are the desolate plains of Frestehal and the Dead Lands, where once the ancient and powerful Quay Empire stood. To the south is the region of Jowea, the coastal cities of the Zweyjen, and the vast rolling Plains of Lochuum. Emotion Energy creates and controls the emotions of all living creatures, running the gamut from fear and anger to calm and love. It allows people to feel their own emotions, protecting them from outside influences. Mental Energy is knowledge, thought and information. It is what gives living creatures intelligence, making them highly attuned to their own perceptions and senses, more likely to notice things, and harder to fool. and sentient creatures. It is life’s corporeal manifestation, and controls the connection to the surrounding world. Blood and muscle, meat and bone — all of these are Body Energy. Physic Energy makes up all the material things on Ethem. 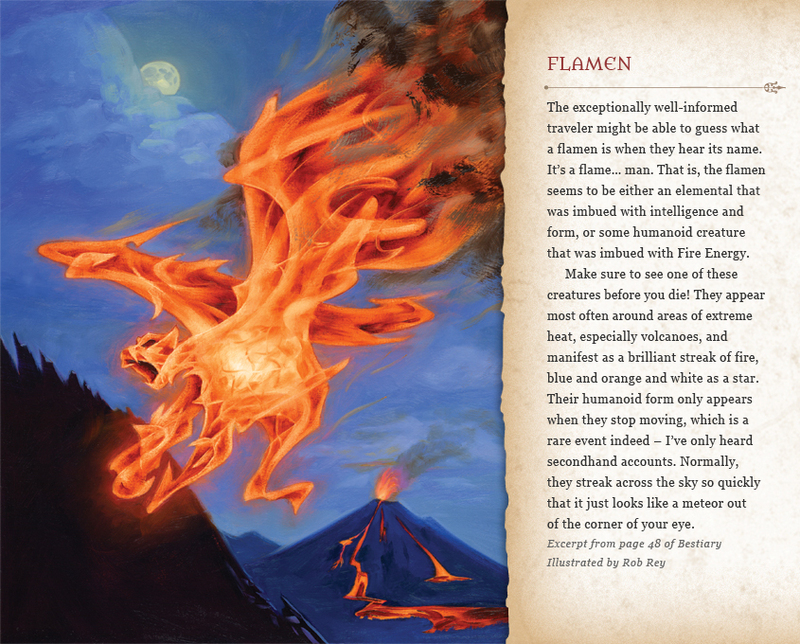 It exists in living things, but is most prominent in stell, stone, dirt, wood, and also in fire and air. Even forces such as gravity exist because of Physic. Shadow Energy does not exist directly in the natural world. The role of Shadow Energy is to break down and separate the other Energies. Without Shadow, the world would be an undifferentiated mass. dawn of history, sorcerers have found times, places and situations where the Energies were particularly prominent in the natural world and made use of these to create supernatural effects. 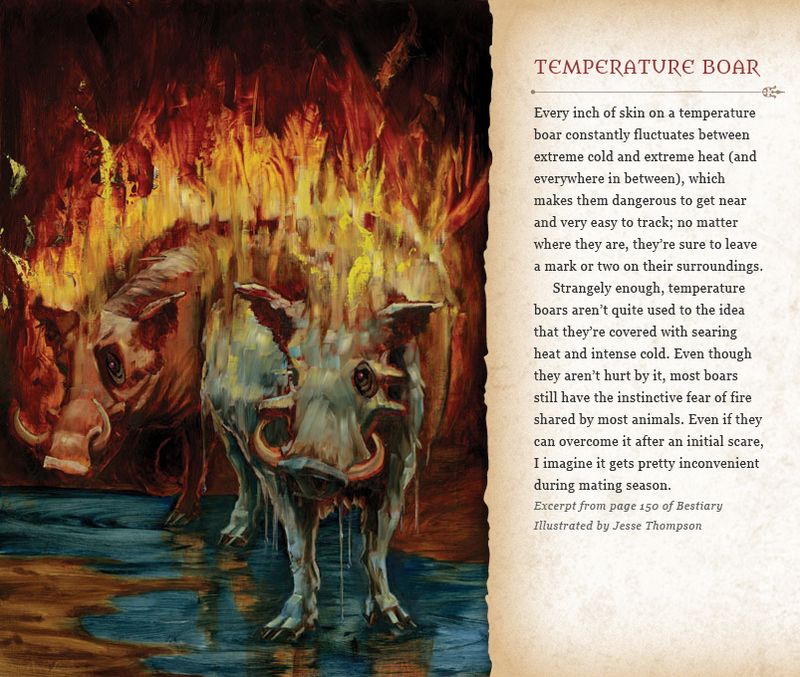 These spells, while very powerful, are often unreliable, as well. However, for many centuries this was the only known way of using the Energies. There are some in Ethem, however, who are more directly connected to the realms of pure Energy. These people have always been distinguished by their ability to learn faster and perform better than others of their kind. Not too many centuries ago, however, this group discovered special ways in which they could channel these Energies from the Energetic Realms directly into the natural world, reliably causing effects of great power (if not the same scale as the spells of some sorcerers). This was the founding of the Science of Energetics, and since then this group of special individuals has been known as channels for their abilities. The Guilds were formed as an association of these people, that they might share their research on Energetics and better learn. They became a powerful political entity as well, however, when they united to defeat an alliance of sorcerers which had threatened political stability across the entire continent a little over a century ago. 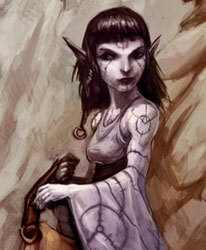 Since that day, the Guilds have been a powerful presence across Tamarra, and sorcerery has been banned. Charismatics Wielders of Emotion Energy, Charismatics lead the hearts of those around them, changing loyalties, inspiring their followers, and creating psychic chaos in their foes. Mentarchs Wielders of Mental Energy, Mentarchs specialize in mental communication, knowledge, foresight, and, of course, telepathy and illusions. Somans Wielders of Body Energy, Somans can use their powers to hurt their enemies, heal themselves and their allies, and strengthen physical abilities. Evokers Wielders of Physic Energy, Evokers can conjure force and energy, teleport, fly, and otherwise break and bend the Laws of Physic to their will. Mystics Wielders of Spirit Energy, Mystics are specialists in strengthening and healing. They bind together what has been torn asunder. 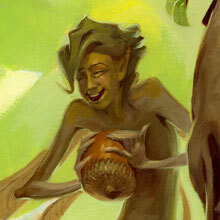 They also possess a special bond to Ethem — the living planet of which Tamarra is but a part — and thus to nature. Umbrists Wielders of Shadow Energy, Umbrists break down what has been built up. They can negate the power of other Energies, slip past mundane defenses, and simply choose to ignore the way the world normally works. The year is SP~5,013, which is to say that we are 5,013 years into the time of the Sovereign Pulse, the most recent Era in this, the Fifth Age of the World. That is when we are. Where we are, to be brief, is on the Tamarran Continent, one of nine continents that make up the great planet Ethem (one of the many Fekxtah that populate the universe). You, the reader, will say that it is important to be brief – but, given the richness of our history, it is also quite difficult. Let us begin with the rise, and fall, of the Emperor Samron. His life was long for a human (SP~3,576 through SP~3,725), and his reign was also long. 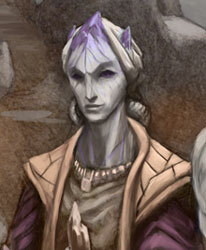 Samron was the first of the Ten Races to conquer virtually all of the Tamarran Continent. He accomplished much during his rule, though there was great evil and suffering during his time, but perhaps the greatest legacy of his rule is his defeat. He was killed in battle by his granddaughter, Drawnwyn, and it was she who then established the Great Council, known today as the Council of Drawnwyn, which oversees the safety of most of the civilized peoples and the proper nations across Tamarra. To say that the Council of Drawnwyn oversees our safety does not mean that it has eliminated all dangers. Far from it. Recently, in the year SP~4,998, the Stillness War ended. This brought with it several things: an end to almost 17 years of warfare, the fall of the Quay Empire, and the presence of a series of “Quiets” (pockets of Stillness) that are dotted across the middle of the continent, presenting a danger to any who would travel in or near them. We have also recently suffered another of the Great Shakes, when the skin of Ethem is rent asunder revealing chasms that reach deep into the earth. 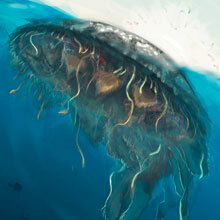 The most recent, in SP~5,005, has allowed those creatures (and beasts) who live under our planet to come to its surface. What started as a geological calamity, that cost many lives, ended in the Wars of Above and Below that began in SP~5,008 and continue to our current day. Then there was the Third Nulentian Invasion, SP~4,970 through SP~4,974. The invasion was repulsed, as were two other invasions by this force from across the eastern seas. However, in the Third Invasion the Nulentians brought with them the Shem Amaum, fierce and merciless fighters who were bred to fight the inhabitants of Tamarra. Even after their defeat, there are persistent rumors and many reliable accounts claiming that some of the Shem Amaum remain on Tamarra and remain a great danger to the unwary traveler. Despite all of these dangers, and more, Tamarra is alive with activity. The Northern and Southern halves of the continent have a constant and healthy trade of services and goods. There are three major cities of the continent, Naldrin City (home of the Council of Drawnwyn), Tarnath (the center of trade and commerce), and the Region of Jowea (home to many of the ruling factions). Each city prospers and is, for the most part, stable. Adamoor is still silent, and has been unreachable for decades now. This presents a mystery to our scholars and professional adventurers. But that is a another story. 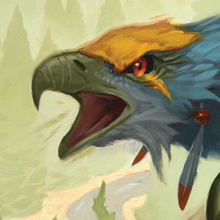 Meet the Ten Races of the Tamarran Continent, the only sentient creatures with a connection to all six of the Energies. The Races form the mainstay of civilization in the Beyonder world -- although they are certainly not the only sentient beings. Where other races are renowned for their wisdom, long lives, strength at arms, or exceptional intelligence, some say that Humans do not particularly excel at anything. However, it takes only the quickest glance at the breadth of their kingdoms, cities, and empires to realize that humans have a unique social ability. Humans tend to be more socially perceptive than other races, and as a result they work better together and better with others. Thus, despite the fact that they are not as militarily powerful as crawns or dwarves, as strong as ushens, as stealthy as wellyns, nor as wise as heola or dwaheelies, humans have managed to build and maintain spheres of influence all over the world. Physically speaking, humans are exactly what you would expect them to be – humanoid . They come in a wide variety of colors, sizes, and shapes. Humans reach adulthood at around 16, old age at around 70, and usually live to be about 90 years old. Because of the constant expansion of their population and thus of their geographical boundaries, humans are not particularly well suited to any environment. Of course, humans will always tend to have knowledge and abilities appropriate to their living places, but they have no innate racial abilities other than an ability to pick up on the customs of those they meet along the way. The most warlike of all the Ten Races, the serpentine crawns can be loyal friends and lethal foes. 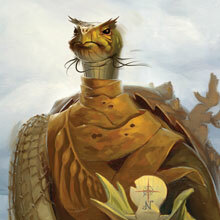 They are tall, scaly humanoids with a penchant for order, and while they make their homes in the desert, their many conquests take them all over the world. Crawns tend to be serious and are great lovers of order. Left in a group – either with other crawns or members of other races – they will almost always try to find themselves a place in the group’s hierarchy, and will create one if they feel that there is not one already available. Crawns are cautious and methodical, but also extraordinarily brave and willing to make great sacrifices – even their lives. Crawns are tall, lithe, and very fast. Their basic body type is mostly humanoid, but their skin is a mottled rock color and scaly. 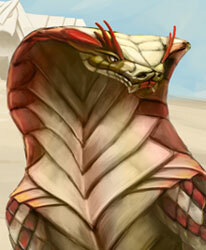 Equally striking are their snake-like necks, usually a foot to a foot and a half long, and their serpentine heads. Crawns reach adulthood at about 20, old age at approximately 60, and can live to about 80 years old – provided they do not die in battle first. Crawns usually live in mountainous desert. The harsh, hot climate is their native one, and it affords them a measure of security against external threats. They settle in places where they can obtain the resources, such as iron ore and at least a minimal water supply, needed for maintaining a society and a finely tuned military machine. 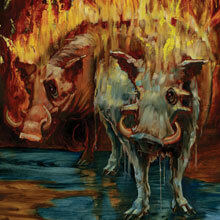 They are carnivorous, and enjoy variety. 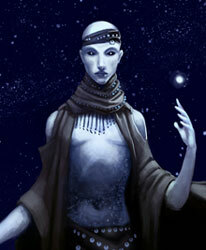 The heola are a tall, lithe people with luminescent skin, who wander the deserts of the world gazing at the stars and seeking wisdom. 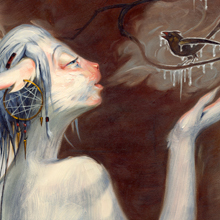 Though not strong of body, they are well suited to more metaphysical walks of life, and their strong affinity with Spirit Energy makes them especially suited to dealing with spirits and the stars. The heola tend to be nomadic and extremely mystical, putting a special stock in the stars and in their significance for earthly life. Socially, heola tend to be fairly subdued and introverted, not readily given to dramatic expressions of emotion. This behavior is often mistaken by other races for indifference, but in reality it is just a mark of their introverted nature. The heola coloring varies, but their skin is typically the color of starlight on a moonless desert night. Sometimes, when they exhale, small amounts of sand will come out in their breath. They are tall and thin – some would even say fragile. Heola have an additional peculiarity in that they are without a gender. They reach adulthood around 50, old age at 130, and usually live to 180 years old. The heola live deep in the desert, past even where the crawn dare to venture. They do not, however, stay long in any one place, and do not attempt to control territory. They will generally travel in fairly set patterns between oases. Free-wheeling and fun-loving, kamaris are some of the most entertaining people in the world. However, it would be a mistake to interpret this as a sign of weakness – their woodland homes are sacred to them, and invaders are met with deadly force. A fun fact about Kamari - they have three genders: male, female, and tree. Of all the peoples in the world, kamaris are perhaps the most independent, free-spirited, and willful. They enjoy a good laugh, and it is easy to see how closely they are related to some of the woodland sprites renowned for mischief-making. Nonetheless, they also have a deadly serious side, which has been revealed to the woe of many an enemy. 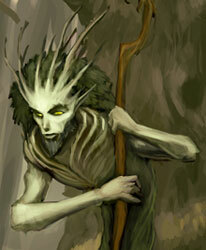 Kamari tend to be very tall and lanky, with brownish green skin and hair that reflects the colors of the forest, with a texture akin to that of small roots or branches. Given their large height and small weight, kamaris are not very physically sturdy, although their agility helps to compensate for that. Kamaris reach adulthood at around 40, old age at around 140, and usually live to 180. Kamaris live, as one might expect, in the woods and forests. They are not fond of conquest or war, but they are territorial. Those passing through a kamari realm are usually watched, although they seldom know it, and those who would do harm are dealt with quickly. Short and strong, proud and practical, Dwarves are known for their tenaciousness, their toughness, and their mastery over the physical aspect of the world. Their well-structured societies and their knack for the arts of smithing and war make them undisputed masters of the cavern systems that run beneath the mountains of Tamarra. When they are not fighting, dwarves like to admire the works of their craftsmen and to eat good food. They are famous for their banquets and their entertainment of honored guests. They are boisterous and crude when merrymaking, but possessed of great seriousness and solemnity if the occasion should call for it. Dwarves are short but robust creatures, their small stature disguising great physical power. Dwarf men grow beards, styling them into different cuts or braids based on age, rank, and clan. 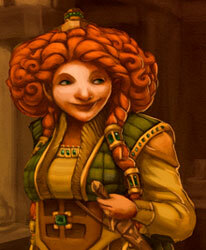 Dwarf women grow their hair long and style it in many ways, each meant to bring attention to their creativity. Dwarves reach adulthood around 30, old age at 70, and usually live to 100 years. Dwarves live in the caverns that stretch under many of the world’s mountain chains. While some dwarves live in naturally-formed caves, large kingdoms often include many miles of passageways and chambers carved out of the living rock. Though living beneath the earth puts dwarves in contact with dangerous creatures, first among them the goblins, they love their homes dearly. Physically small and unassuming, dwaheelies have a reputation the world over for their wisdom and intellect. They have wings like a set of beautifully draped capes, one beneath each arm, which allow them to glide, and - with practice - even to fly. The greatest strength of the dwaheelies is their knowledge and intellectual curiosity. Despite their small size and high-pitched voices, dwaheelies are known for conducting themselves with the great dignity they see as becoming to a race of scholars. They will often look down on those less knowledgeable than themselves, but they respect a desire to learn, and are happy to share most of what they know with any who ask. Dwaheelies are small, humanoid creatures usually standing only 12 to 24 inches tall. The wings beneath their arms make them look as if they are wearing a well-marked cape, but they are humanoid in all other respects. Dwaheelies reach adulthood at around 50, old age at around 120, and usually live to be about 150 years old. Due to their small size and intellectual focus, dwaheelies have never felt the need to create political entities, such as kingdoms. Instead, they live in naturally formed caves, usually high in the mountains where they are relatively safe from most threats. These caves are well cleaned and contain light wooden structures, resembling miniature igloos that cover the caves’ floors and walls. Ishiris combine an earthy practicality with a compassionate love of nature and life. They are tall, solidly built, and live on mountaintops, where their stony skin allows them to blend in well. The ishiris demonstrate incredible durability, and have some power over the earth - some legends tell of ishiri who could turn completely to rock. Ishiris are fairly orderly and serious by nature, but not nearly as much as the Crawns or Dwarves. They are eminently practical thinkers, and can be counted on to come up with realistic solutions to problems. They treat unfamiliar people in a polite and business-like manner, but tend to be reserved about showing their true emotions until they know someone well. Ishiris have skin that is grayish in color and somewhat rough to the touch, much like the rocks they live among. Their hair is usually a shade of gray with a silvery sheen, but there are also some with black or white hair, and even some with hair brightly colored like a gemstone. Ishiris reach adulthood at around 25, old age at around 70, and usually live to be about 100 years old. While dwarves, with whom the ishiris frequently ally themselves, live under the mountains, ishiris live on top of them. Their particular nature connects them to stone and rock, but they are also deeply connected to life of all sorts, and do not wish to lock themselves away from most of it. Ushen are intellectually slow, but large of body and of heart. They feel that their size and strength give them a duty of stewardship over nature, so they dwell where nature is most abundant. The ushen are a nomadic people. 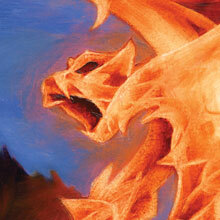 They have a very rich spiritual heritage, and are perhaps best known for their immense size, strength, and toughness. Ushen are very individualistic, and although they have great respect for each other, and for all life, they can be extremely stubborn. Often this leads to protracted argument, which is eventually forgiven and forgotten, but has sometimes been known to result in Ushens actually having to leave their tribe. 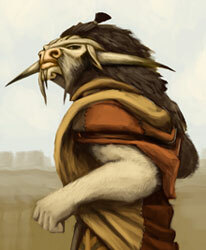 Ushen resemble large, muscular human beings with fine, light brown fur, and faces like those of their bull ancestors: they have a snout, black pupils, and a set of deadly horns. Their legs are more like those of a bull than a human, with hooves for feet. 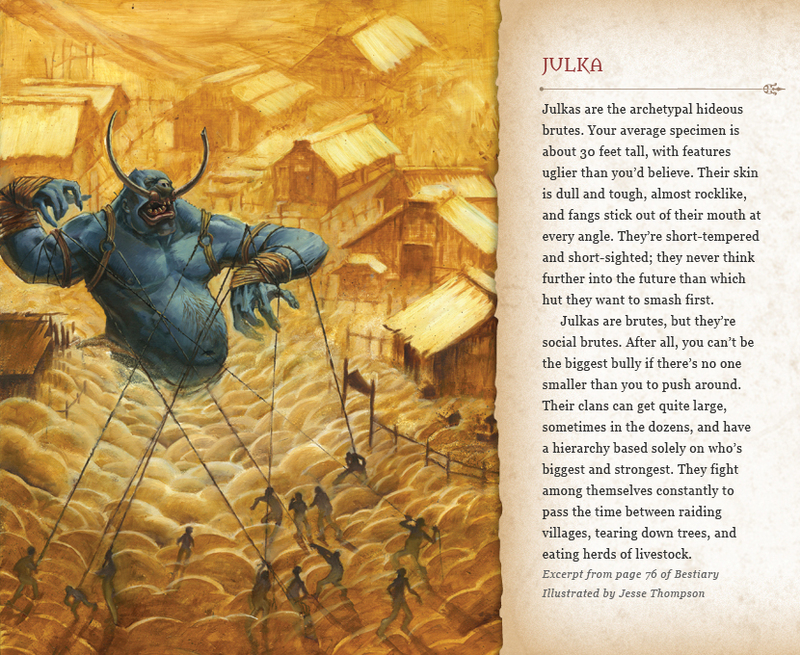 Ushen are huge, standing 7’ to 9’ tall and weighing 300 to 400 pounds. They reach adulthood around 25, old age at 60, and usually live to 80. Ushen live mostly in fertile plains and grasslands. They enjoy forests, often living near them, but their large size would make traversing them difficult. They enjoy nature in all its forms, but they especially enjoy plant and animal life, hence the rarity of their presence in deserts. The ushen diet consists mostly of plants, with meat often added from hunting on the bountiful grasslands. 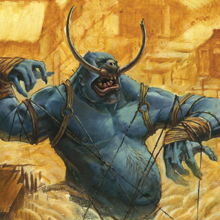 The seafaring zweyjen are known for their insatiable desire to discover new places and things, as well as their remarkable ability to leave well enough alone once they find them. They are well equipped to travel, having a strong bond with fish and with sea birds. Of the Ten Races, they are closest to being truly aquatic. 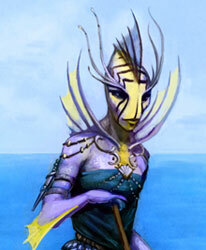 Zweyjen are particularly notable for their wanderlust, as becomes such a naturally seafaring race. They are generally fairly good-humored, but don’t like to stay in any one place – or on any one topic – for too long, as they become bored quite easily. 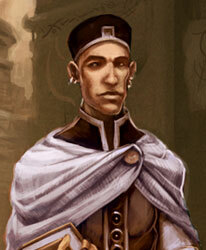 While this tendency does mellow with age, zweyjen have nonetheless fairly earned their reputation as wanderers. Zweyjen are creatures of water. Their skin can be a range of colors, similar to those of tropical fish, and is sleek and smooth, made up of thousands of minute scales. They do not have hair, but instead a series of colorful fins and wisps of hair-like substance. They are typically 6’ tall, though up to 8’ is not abnormal. Zweyjen reach adulthood around 40, old age at 150, and usually live to 180. Zweyjen live in coastal areas and get their food by fishing. Some also use their maritime skill to become navigators or traders. At times they make their homes in freshwater lakes. But this is rare as lakes do not offer the expanse for exploration as does the open sea. In large lakes, though, or inland waters connected to the sea, zweyjen have been known to create thriving cities. Best known as clever tricksters, wellyns can do more than simply pull off pranks. Despite being relatively short-lived, they are some of the world’s best inventors and tinkerers, and their small size and natural agility -- not to mention their legendary good luck -- suit them well for any pursuit requiring stealth, creativity, and risk. Wellyn are very fond of pranks, which function in wellyn society in the same way that argument, debate, and dueling do in others. Disputes and grudges are often settled with a contest to see who can out-prank the other. This fondness for pranks is different in each wellyn: some are harmless, carried out on the spur of the moment, while others take years to plan and implement. These strange-looking creatures have long, lithe bodies and long, dexterous fingers, all covered in a fine green and brown striped fur. While they usually stand upright at 3 feet tall, their hind legs are long and powerful, with feet made for agility and jumping. They are fast runners, and powerful jumpers on all fours. Wellyn become adults at 14, elders at 45, and usually live to 55. 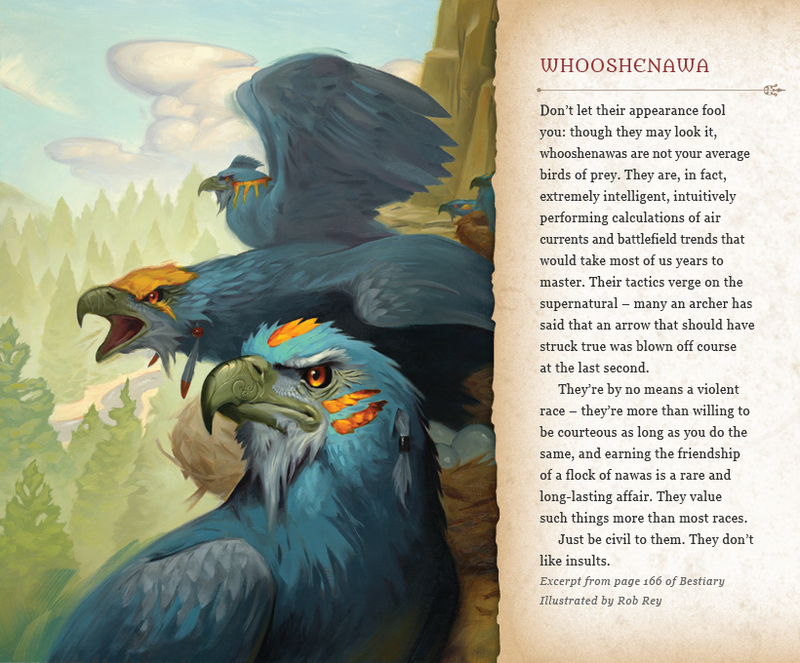 In ancient times, wellyn lived in the upper canopies of the forest, where their coloration and knack for climbing helped them avoid predators. 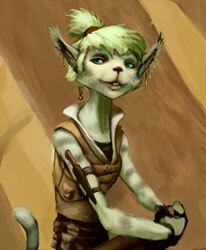 While those days are long past, wellyn still live in the treetops, which they have come to regard as their rightful home. They are somewhat territorial, but rarely resort to armed force, being more likely to rely on pranks to protect themselves. into life on the Tamarran continent, in all its arresting beauty and stark power. click on a thumbnail below to view the entire image.